As the Fifa World Cup 2018 hits fever pitch, a Colombian man has shown the Internet what the beautiful game truly means by helping his blind and deaf friend experience their country's win over Poland. Colombia fan Jose Richard Gallego lost his hearing and vision to a disease when he was nine years old. But that did not stop him from following every movement on the pitch when Colombia beat Poland 3-0, thanks to his good friend Cesar Daza. 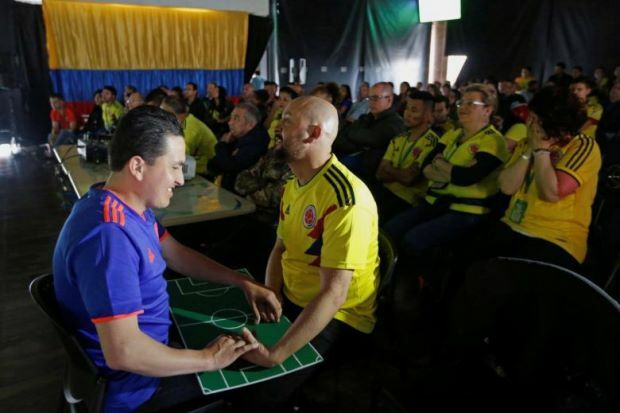 Daza came up with a series of unique hand gesture to describe the match his friend in real-time as they sat among a cheering crowd in a bar in the capital Bogota. He mimics the players' position by moving Gallego's hands on a scaled-down football pitch in front of them. There are also different gestures for penalties, corners, throw-ins and red cards.